Japanese Billionaire Will Be First Tourist Around moon. Space X recently reveal its first passenger for a trip around moon. A man who is a billionaire from Japan. Hawthorne, United States : Mr Yusaku Maezawa is a billionaire from Japan and 18th richest person in country as per Reports, this japanese billionaire will be the first to fly on a monster space rocket for the journey around the moon, and this annoucement was made by the company from its Headquarter Hawthorne, California. As per the Space X CEO Elon Musk Said at event - 'the trip is going to be four to five days trip'. 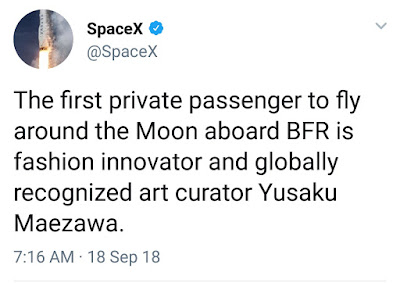 And as per the report Maezawa may take some artist with him for his trip to moon. This trip is going to be possible with the Big Falcon Rocket ( BFR ) which is announced in 2016. Yusaku Maezawa 42, is a Japanese billionaire, entrepreneur and art collector. And founder of start today and also launched the online fashion website zozotown. He's Business Person with Net Worth near US$ 2.7 billion as per reports. The flight for this space trip planned to take place in 2023. The space X also wrote some amazing history in its past now it's also amazing update for humans like a trip around moon. And there are also various type of projects which we see in future and waiting to get amazed from this company. 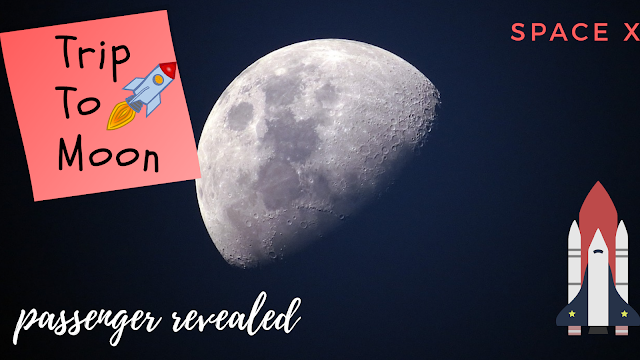 The Elon Musk Said , he would not reveal the price what Maezawa paid for the moon trip but said it would be free for the artists. There are also various type of space company who's planning for space tourism and as per the reports the Russian and Chinese companies are also planning for space tourism.